This report encourages building public-private partnerships and offers steps for pharmacists and public health professionals to begin laying the foundation of long-lasting, mutually beneficial partnerships. The health of a community relies on the actions and contributions of both public- and private-sector entities. 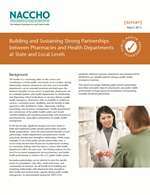 Strong relationships between pharmacies and state and local health departments can be mutually beneficial and build upon the inherent strengths of each sector. In particular, pharmacies can be a valuable partner with health departments for distributing and dispensing critical medications or vaccines during a public health emergency. Pharmacies offer accessibility to healthcare services, convenient hours, familiarity, and the benefit of daily experience with distribution chains, dispensing, tracking, monitoring, and inventory management. Health departments are cornerstones of the public health system and should consider building and sustaining partnerships with pharmacies and pharmacists, especially in preparation for public health emergencies.